The lakes are beautifully landscaped, safe and well thought out, incorporating bays, controlled weed beds, rushes and islands. The swims are large, safe and comfortable for night fishing. 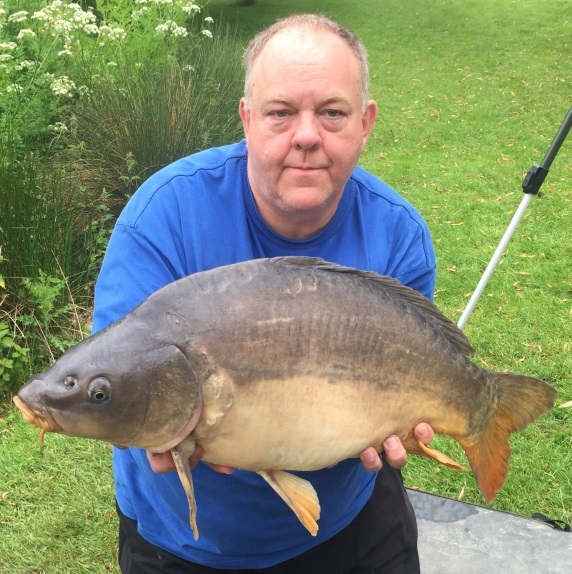 There are two well stocked specimen lakes containing many superb specimen carp, over 30lbs+, the larger of the two specimen lakes - Lake 2, also contains an abundance of catfish (introduced in July 2002) and some now over 50lbs together with specimen carp. Both of these lakes have well kept natural grassy banks with lovely views of the surrounding countryside, a truly magical place to spend the day fishing. See the Availability Page for swim availability. Each specimen lake is limited to typically no more than four anglers. Subject to availability any angler may book any lake. For details about becoming a Manor Fisheries Member, please visit the Membership page. The Carp lake covers 1.1 acres and is stocked with approximately 150 plus double figure Commons and Mirrors weighing typically 15 lbs to 17 lbs but rising to over 30 lbs+. Though not generally targeted, there are also present a few Bream to 7 lbs+, Perch to 3lbs+ and a small number of quality Roach to 2½lbs. With regards to tackle, a monofilament 12lbs to 15lbs line is recommended and ledgering is running ledgers only. Although baits are not a precise science, choose from a variety of bolies and ledger in the margins. This has proven to be productive and sometimes they can be tipped with a piece or corn to provide colour contrast during bright weather conditions. Use a small PVA string or bag as this is better than loose bait which attracts the ducks. The use of smaller baits tipped with maggots when the water is very cold is also successful. Traditional baits such as luncheon meat, worms, sweetcorn, etc. will also bring results. This lake covers 1.2 acres and is stocked with an abundance of Catfish (introduced in July 2002) weighing up to 50 lbs plus. The average Catfish weight is around 25 lbs and the anglers (up to four) typically report on average 3 x 30 lbs plus Cats per day. Though not generally targeted, there are also present approximately 90 plus double figure Commons and Mirrors weighing in the range 15 lbs to 17 lbs but rising to over 30 lbs plus. With regards to tackle, a monofilament 20lbs line is recommended and ledgering is running ledgers only. A size 6 or 4 forged barbless hook tied to a 40 lbs braid hook length completes the business end. Have at hand a large landing net as the Cats can be over 5 feet in length. Baits are typically fishy flavoured pellets/bolies and sometimes luncheon meat, squid or prawns. A bunch of worms can also work when ledgered or float fished over depth. Feed the float regularly with 2 to 3 mm halibut pellet to attract smaller fish which in turn makes the Catfish “curious”. 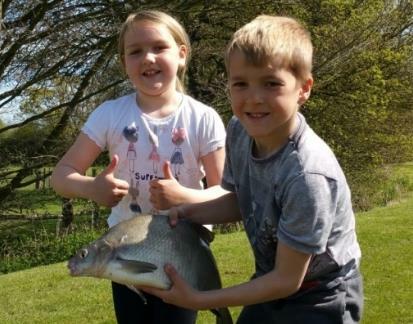 Both lakes have well-kept natural grassy banks with some seven to eight individual Swims (some are doubles) and lovely views of the surrounding countryside; a truly magical place to spend the day fishing. These two specimen lakes are both limited to typically no more than four anglers, guaranteeing anglers are never knowingly over crowded. The Mixed Lake 3 is a 1.6 acre "Pleasure" lake holding a wide variety of fish with masses of smaller carp (Common and Mirror to mid-doubles), tench and bream both over 8 lbs+, roach, rudd, crucians and really good perch all in a natural environment including rich bank cover with some near and far side margin Canadian pond-weed acting as an ideal oxygenator and natural living filter system. This lake is ideal for beginners and experienced anglers alike, used to pole, whip or rod. 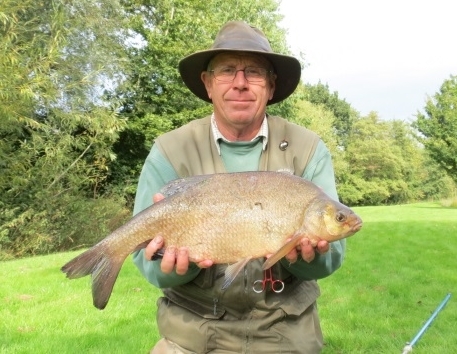 Both waggler and ledgering techniques are popular and anglers have had huge bags of fish in a prolific session resulting in Clubs booking matches. With many fish exceeding 10lbs a minimum 6lbs hook length is recommended. Juniors are welcome but must be supervised by an adult. These include safe landscaped surroundings and a hard standing car park (plus the adjacent field during summer) for cars and vans but not lorries. The comfortable lakeside Cabin is equipped with a flush toilet, hot and cold running water, tables and chairs, microwave, kettle and toaster. Tickets for Fishing are available to Members but strictly via pre booking as swims are limited to ensure plenty of space for each angler. For example each specimen lake is limited to typically no more than four anglers and the Mixed lake to 20 anglers. No fish (dead or alive) to be brought onto the Fishery. For Swim availability see the Reservations Page.